I love pigeons. I also love Scottish newscasters. Public Service Announcement: Steak ‘n Shake now has their Halloween shakes available for purchase. Rejoice rejoice! I was saddened to hear that they are not carrying the S’Mores shake anymore (since when are S’Mores a Halloween thing anyway?) but they do have a Caramel Apple Sippable shake that was quite tasty, very apple-y, fabulously caramellific, and indeed sippable. I had a rough day today (they seem to be coming fast and furious lately) and decided I needed a little treat. So now I have a belly full of yummy shake, a warm and stripey kitty asleep on my legs, and nothing to do tomorrow but to hop in my recently reconstructed car and drive to see the G-pants and baby OLE. Things seem to be looking up. Here’s a bit of hard-earned wisdom for you: Goodbyes are hard. I know, I’ve shocked you again with my insight and unique take on the world, but there you have it. This morning I had to say goodbye yet again to a dear friend, wishing her well as she takes off for a new life in parts far away. A small group went to breakfast at The Goodbye Breakfast Place, where I’ve only been on occasions such as these. (It is a great local diner, BTW, with the most amazing french toast/pancake concoction. I often think I should frequent more often, but since I’ve only ever been on very sad days, usually hung over, always exhausted, it’s sort of tainted with emotion. Also, it has weird bathrooms. But I digress.) Afterward we went to visit her awesome new car and say the final farewells. Despite valiant efforts and mental preparation, I was overwhelmed and as it became apparent that my sadness was going to manifest itself as less of a dainty, red-faced, closed-mouth sniffle and more of a shaking, wretched sobbing affair, I decided that I couldn’t just stand on the sidewalk snerffling. So I ran away. I’m pretty sure E understands. This is an extra tough goodbye because it is the last one, at least until I’m the one leaving. You know, one of the most beautiful things about my time here has been finding and connecting with like-minded souls. I’m old enough to know that forging adult friendships is not easy or common. Having an entire group of people that get it/you is almost more than a person should expect. Watching those people trickle out of my daily life is painful, but there is a pride in knowing that people I love and who love me are scattered around this world, making other people’s lives more exciting, or more relaxed, or more educated, or more optimistic. But of course I’d rather have them all right here next to me. It’s hard to be so love-filled and so selfish at the same time. So today, I am very very sad. I shall wallow and watch sad sad movies and cry and maybe call my mom. And then I’ll wash my face and head out to have some new fun with the fabulous people I still have here with me. Today Little Red Car learned a valuable lesson about how rough the real world can be. I’ve tried to shield her as best as I could from the harsh realities, but I suppose I always knew this day had to come eventually. After spending this rainy afternoon at the mall I trotted out to find this lovely picture waiting for me. Sigh. After calming down a bit — thanks to Mr. G-pants fielding a tearful phone call and the super helpful and patient fellow-shoppers Erin & Kasia — I managed to get the police to come fill out a report in less than the projected hour despite the Rah Rah Football Game taking place on the other side of town. The officer that responded even turned the game down a bit on the radio while we talked – impressive. Oh, Big Ten towns. And then once we cleaned up the major glass enough that I could drive home, Little Red Car and I shared a jaunty, soppy ride home. Mostly now I’m just really annoyed that I have to deal with the the fallout of someone else’s dumb choice. I realize that people are burgled all the time and that is an unfortunate part of living around, you know, others. But I’m annoyed that the jerkfaces did this on a rainy day. I’m bothered that they chose my dinky car out of the hundreds in the lot. I’m also annoyed that they did it on a Saturday, so that I’ll have to wait a couple days to get it into a garage. I’m annoyed that they smashed out the whole window instead of just a smallish part or jimmying door open. I’m annoyed that they took the CD that was in the player – mostly because it was the final CD in the The Subtle Knife audio book and a library loan to boot. 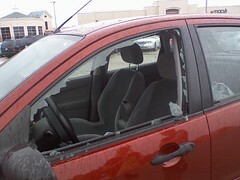 However, I am grateful that they only stole the stereo and not the whole car. I’m also slightly impressed that they thoughtfully removed the OTHER CD’s I had in the little compartment of the stereo and set them nicely on the seat instead of stealing them or smashing them. I’m grateful that I have insurance and a network of friends who are willing to help me. I’m lucky that I even have a car to be broken into and that the damage is relatively minor. But I do think it is a little funny that I lived in Chicago for 6 years and never had a single thing happen, then I move the “safety” of small-town Midwest and my car gets roughed up twice in 6 months. Tough times in the corn belt. I blame the cows. They are just the shady sort to do this. Stupid cows. Most of the time I truly enjoy living alone. There are times that I really hate it though. Like when there are giant bugs or spiders that need to be addressed, for example. Or when there is heavy lifting to do. Or when I can’t figure out what to wear. And of course when Magellan barfs all over the place. Obviously. However, the worst is when it is almost 2am and I have to be awake in a few hours, but I’m feeling slightly ill from the unfortunate combination of having a migraine, the side effects of the migraine meds that don’t really help but that I take in an effort to feel proactive, and the giant pile of unwashed dishes in the sink (abandoned there due to the migraine) that smelled like delicious dinner 6 hours ago, but now just smells like a horrid mix of cat food and onions and fish and asparagus all mixed together. Add on top of that the very poor decision to watch 2 zombie movies in the last 3 days and an overactive imagination and you have an Up-All-Night Keem, which will soon turn into a Very-Short-Fused-and-Needlessly-Snappish Keem, which is sure to be a delight for everyone I encounter tomorrow.